Deede Uche's World: FOR LADIES: THE DANGERS OF WEARING HIGH HEELS!! FOR LADIES: THE DANGERS OF WEARING HIGH HEELS!! Prolonged wearing of high heels can cause a permanent damages like bunions, hammertoes, leg tendons.. This are mainly caused due to pressure on ball of the foot. The higher the heels, the greater is the pressure. This can also affect the knee and back. 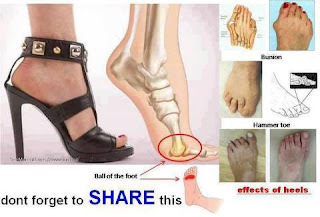 So on wearing high heels continuously you are increasingly damaging your feet. If you love your health be cautious. THE DANGER OF DRINKING COLD WATER AFTER MEALS!! !